On my last trip to New York I was able to get in another day at the 20x24 Polaroid studio. I have added these images to the Behind Photographs, folio II, on my site www.mantoani.com. These include the amazing work of Harry Benson, Jim Salzano, Chester Higgins Jr, Art Brewer and David Doubilet. Please stop by and check them out. I have now documented 87 photographers for this project and will be in New York again for Photo Plus to shoot more. Again, my sincere thanks to all that photographers that have been so willing to share their time and images with me. 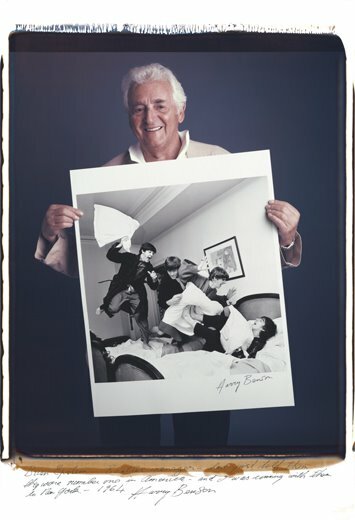 One of the highlights of the shoot was hearing Harry Benson tell his story about The Beatles "Pillow Fight" image, taken in Paris in 1964. Harry was set to go to Africa while working for a newspaper when he got the call. He didn't want to go shoot "a band", he wanted to go to Africa. The Beatles were just starting to get some press and he was told, "You ARE going to Paris". One night the George V, one of the guys mentioned a pillow fight they had in the hotel room as few night prior. However, there was another photographer in the room, so Harry didn't say a thing. However, I couple of nights later, they were at the hotel late and their manager, Brian Epstein came in with a message to say they were #1 in American and that The Ed Sullivan Show wanted them to come to the US. That is when Harry asked about doing the pillow fight. Lennon said it was a very stupid idea and that was the end of the conversion, until he snuck away and moments later banged Paul in the back of the head with a pillow..... "And that is how it all began". This evening lead to Harry coming to the US with The Beatles and yet another of his famous shots of them getting off the plane, but that is another story!